Hey guys!! I’m SO excited about this video. I had a ton of fun creating some DIY home decor with a few saved items I decided to upcycle. I really hope you try one out and make it unique to your own style and preference.. That’s what this is all about. Have fun with it!! Upcycled Candle- Save an old vase and turn it into a unique candle.. I used Love Spell candle scent which I special ordered from a candle supply store. Upcycled Vases & Jars- If you have old glass jars you want to change up, try spray painting them with a cool foggy matte spray paint like this sea foam one from Michaels. Super easy, and gives it a great new look. DIY Rustic Coasters- Staining wood coasters and glazing them is a quick and easy way to create a unique coaster for your beverages. Upcycled Wood Necklace Holder- Create a unique piece for your closet or bedroom with some wood, wood stain & unique knobs.. You could also paint it white or another color to represent your own style. 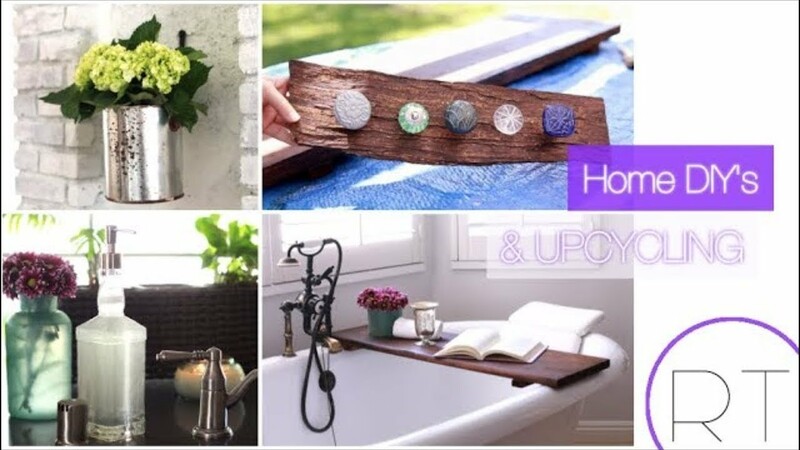 DIY Bath Tray- Create an easy custom bath tray. Measure your bath and run to home depot for a custom cut of wood. It’s super affordable and pretty easy. Drill some feet on the bottom, stain or paint the wood, and you have a unique piece for your bathroom. Upcycled Glass Soap Dispenser- My husband had a Jack Daniels Whiskey bottle left over from a food photography shoot he did. I decided to keep it, remove the label & turn it into a soap dispenser for the sink. I LOVE how it turned out..
DIY Hanging Paint Can Holder- If you have an old paint can, use it to hold flowers.. You can either put it on display on a table or hang it for a unique look and feel. You could also paint the can if that’s more your style.